What Is the Glycemic Index and How Can it Help Me Lose Weight? The glycemic index (GI) is a measurement developed by Dr. David J. Jenkins and his associates at the University of Toronto in 1981. They were researching diabetes, and how to reliably predict the effect of certain foods on the body's blood sugar and insulin levels. The glycemic index rates carbohydrate-rich foods on a scale of 1 to 100, pure glucose being the highest (100). A food's GI rating indicates how rapidly it is digested or absorbed by the body; the higher a food is on this scale, the faster your body will use it up. How does the GI relate to losing weight? So the glycemic index can be quite useful when trying to lose weight, and a useful complement to other diets. Foods with high GI ratings – white bread, cakes, white rice, baked potatoes, jams, jellies, and many processed breakfast cereals – will trigger this "yo-yo" effect, and leave you craving more food very quickly. These foods also tend to be high in calories. Foods with a GI rating lower than 55 – fruits and vegetables, milk products, high-fiber grains and cereals, beans and lentils, sweet potatoes, and pasta – have the opposite effect. They take longer to be digested, leading to an increased feeling of satiety. Because these foods are less processed, and because of their high fiber or particle size, they take up more space in your stomach and leave you feeling more satiated and full. As a result, you are less likely to "binge eat." Paying attention to the GI ratings of foods has been proven to be a useful adjunct to many famous diet plans. Studies have shown that people on low-GI diets tend to lose more weight and keep it off than those on high-GI diets. One of the most successful commercial diet programs, Nutrisystem®, is largely based on glycemic index research. Whatever the diet program you choose, paying attention to the GI index of the foods you eat can help you make wiser choices. A diet rich in protein (which does not cause the same glycemic response in the body) and low-GI foods is going to be more likely to succeed. 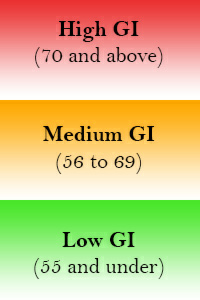 In addition, eating foods that have low GI ratings can be beneficial to your health in many other ways. Low-GI diets have been proven to reduce blood fat levels. They also provide more sustained energy during the day, offering a steadier release of sugar into the bloodstream, instead of a "sugar rush." This sustained release of nutrients helps to keep both your blood sugar and your energy levels more stable, which provides a healthy stability to the system, as opposed to the "yo-yo" effect. Low glycemic index diets have been proven to increase athletic performance, and have been shown in studies to improve blood cholesterol levels and reduce heart disease and metabolic syndrome. Foods with a low GI rating are also rich in phytochemicals, which have known protective and disease-preventing properties. Naturally, remembering the original inspiration for Dr. Jenkins' research on the glycemic properties of foods, diets that are rich in low-GI foods can also help to lower the risk of type 2 diabetes, a disease that is sadly becoming epidemic these days. How do I take advantage of the glycemic index ratings? As with any diet, however, moderation is the key. Don't rush off and look up a list of foods with low GI ratings and eat only those foods. Combine them with the recommended amounts of meat, chicken, fish, or other proteins. But becoming more aware of the glycemic index and the ratings assigned to common foods can help with almost any healthy diet, if for no other reason than that low-GI foods tend to be more natural, less processed, and thus better for you.